If 2’s company and 3’s a crowd, then 4 must be a pack-’em-in party that fills the house with wall-to-wall excitement. That it definitely is – if you’re talking about American DJ’s new Quad Scan LED, an amazing RGB effect that combines 4 Tri-Color LED scanners into one portable lighting unit. A sleek-looking rectangular fixture, the Quad Scan LED is equipped with 4 powerful 3-watt Tri-Color RGB scanning lamps that produce a variety of brilliant colors and gobo patterns. Moving to exciting built-in programs, the 4 scanners project their dazzling effects throughout the entire room, providing extremely wide area coverage and giving mobile entertainers and nightclubs plenty of bang for their lighting buck. 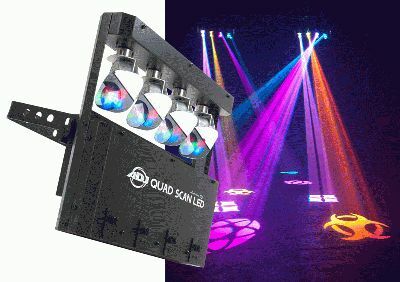 With each of its lamps consisting of a Tri-Color LED source (red, green and blue), the Quad Scan LED provides superior RGB mixing and bright, vivid colors. The unit also comes with 4 replaceable gobos (gobo size: 20.5mm; viewable size: 12mm), which can easily be substituted with custom gobo designs such as a club logo, party themes, names of the bride and groom, or drink specials. Combined with the Quad Scan LED’s far-reaching scanning action, this customizability lets you instantly project any “message” or graphic throughout an entire room or venue. Perfect for working DJs, mobile entertainers, bands, clubs, roller rinks and bowling alleys, the Quad Scan LED is very compact and lightweight; its rectangular shape lends itself to easy transport and storage. Designed to be very budget-friendly too, the highly portable unit does the job of four scanners and more, all for an affordable MSRP of just $419.95. Although it covers big areas, the Quad Scan LED consumes very little energy, drawing just 65 watts of electricity at maximum use. Maintenance costs will be kept to a minimum as well, since the unit’s 4 long-life Tri-Color LEDs have a lifetime rating of 50,000 hours and virtually never need replacing. Equipped with a built-in fan, the Quad Scan LED can run all night without duty cycles. The Quad Scan LED includes multi-voltage operation: AC 100–240V, 50/60Hz. Designed for easy portability and packing a powerful punch for its size, the compact and lightweight fixture measures 17.25"L x 13.5"W x 5"H (438 x 338 x 126mm) and weighs only 13.5 lbs. (6kgs) — making it especially attractive for mobile DJs and traveling performers. Users can easily attach the provided hanging clamp and safety hook for worry-free mounting. The MSRP of the Quad Scan LED is $419.95.